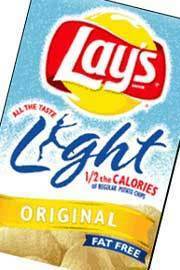 Frito-Lay has been notified that it will be sued by a Massachusetts consumer for deceptively marketing its line of "Light" potato chips. Those chips are made with olestra -- the controversial fat substitute that causes diarrhea, stomach cramps, and other unappetizing symptoms. She says that she would not have bought the product had she had known the chips contained olestra and is asking the court to require labels on Light chips warning consumers about the potential for adverse reactions. She is being aided in her lawsuit by the nonprofit Center for Science in the Public Interest (CSPI) and by Massachusetts lawyer Kenneth D. Quat. The laxative-like effects of olestra became fodder for late-night comics in the mid-1990s, but the complaints filed by people who became sick after eating olestra are not so amusing. Since 1996, the Food and Drug Administration (FDA) has received from CSPI, Frito-Lay (a division of PepsiCo), and Procter & Gamble (the developer of olestra) more than 20,000 adverse reaction reports -- mostly involving diarrhea, flatulence, greasy stools, stained underwear, orange-colored oil in toilet bowls, and cramps. Some consumers have sought medical attention in emergency rooms (and even undergone surgery) or experienced incontinence in public places after eating chips made with olestra. In 2003, under pressure from the food industry and over the objection of CSPI, the Food and Drug Administration dropped a requirement for olestra-containing foods to bear a label warning consumers about abdominal cramping and loose stools. Then in 2004 Frito-Lay quietly renamed its olestra-containing line of "WOW!" chips as "Light" -- a move that CSPI says was designed to intentionally deceive people into thinking that the product was an entirely new olestra-free lower-calorie chip. "It's bad enough that Frito-Lay still uses this discredited and dangerous chemical, one of the most infamous food additives in history," said CSPI litigation director Steve Gardner. "But by quietly changing the name of this product line and purposefully deemphasizing the presence of olestra, Frito-Lay is really tricking consumers. And that deception is putting Americans at risk of some pretty unsettling side effects. CSPI has taken this action only after many months of informal efforts to convince the company to take corrective action voluntarily." Since Frito-Lay rebranded WOW! chips, sales have increased sharply, and CSPI has received a sharply increased number of complaints, including from people who ate the chips thinking they did not contain olestra. A 66-year-old Cherry Hill, N.J., man required hospitalization after suffering dizziness and vomiting after eating Lay's Light regular potato chips. A 37-year-old woman from Randelman, N.C., began throwing up and having diarrhea shortly after eating Doritos Light and Ruffles Light chips. Her symptoms lasted for two days, and she required six bags of intravenous fluids in the emergency room. Two Lexington, Okla., siblings, aged 7 and 10, experienced severe stomach pains, greasy stools, and vomiting after eating Tostitos Light chips, according to their mother, who contacted CSPI. "I remember learning about the effects of olestra, so never in a million years would I have knowingly purchased potato chips that contain it," said Lori Perlow, the plaintiff. "I was driving my car when my symptoms hit. Frankly I feel lucky to have reached my destination in one piece." Chips in Frito-Lay's "Light" line include Doritos Light, Lay's Light original and barbecue, Ruffles Light original and cheddar and sour cream, and Tostitos Light. Procter & Gamble makes Fat Free Pringles with olestra in original and sour cream and onion flavors; it, too, has taken the sales-killing Olean logo off its packages. Procter & Gamble developed olestra and owns the brand name Olean, though in 2002 it sold the Cincinnati factory that actually manufactures the substance. Two other chip makers, Herr's and Utz, dropped their olestra chips. Canada and the United Kingdom both rejected the use of olestra. "Frito-Lay knows that its Light chips will send hundreds of consumers to the hospital and many thousands frantically rushing to the nearest toilet," said CSPI executive director Michael F. Jacobson. "Changing the name from WOW to Light reflects Frito-Lay's duplicitous efforts to save a dying product, regardless of consumers' wellbeing. We hope the court requires Frito-Lay to stop the deception, to place prominent warnings on packages, and to sponsor television commercials and full-page newspaper advertisements to disclose the deception." "The demand letter asserts that Frito-Lay has engaged in the very kind of deceptive conduct that the Massachusetts Consumer Protection Act was designed to address," said Kenneth Quat, the Massachusetts lawyer. "If a lawsuit becomes necessary, we believe that the rights of Ms. Perlow and other consumers to be informed of the risks of ingesting olestra will be vindicated." In recent months, CSPI has increasingly turned to the courts to seek changes in several food companies' practices. It has negotiated settlements regarding the deceptive labeling of such products as Tropicana juice drinks, Quaker Oats oatmeal and grits, and Aunt Jemima frozen waffles. CSPI has lawsuits pending in state and federal courts and is working with outside lawyers to get courts to curb soda sales in schools.